University of Hawaiʻi at Hilo graduate Katherine Mulliken was captured in one of the most dramatic photos taken of the eruption on Hawaiʻi Island. Mulliken was born and raised on Hawaiʻi Island and grew up in Volcano Village right outside Hawaiʻi Volcanoes National Park. She works as a geologist for the Division of Geological and Geophysical Surveys, a cooperating partner of the Alaska Volcano Observatory, but was sent back home to help with the U.S. Geological Survey’s Hawaiian Volcano Observatory response to the 2018 Kīlauea eruption. 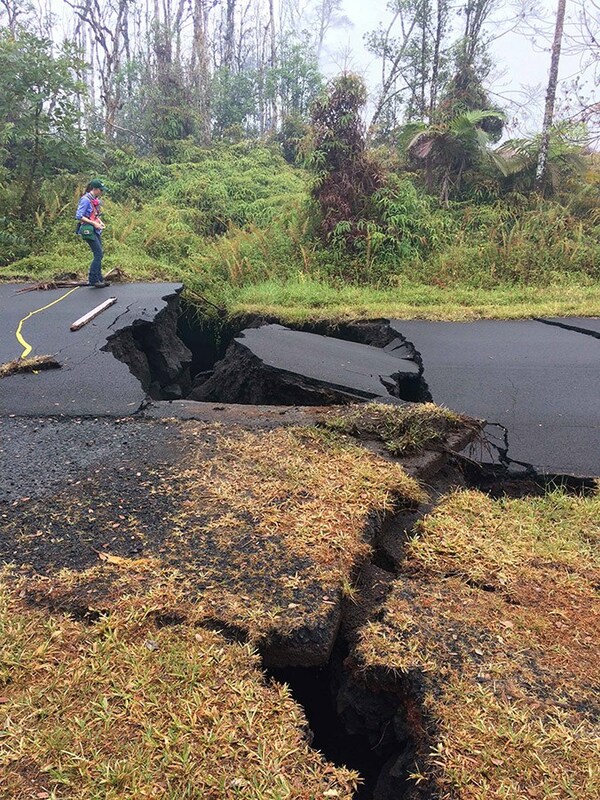 Important information in evaluating the hazards created by the eruption. 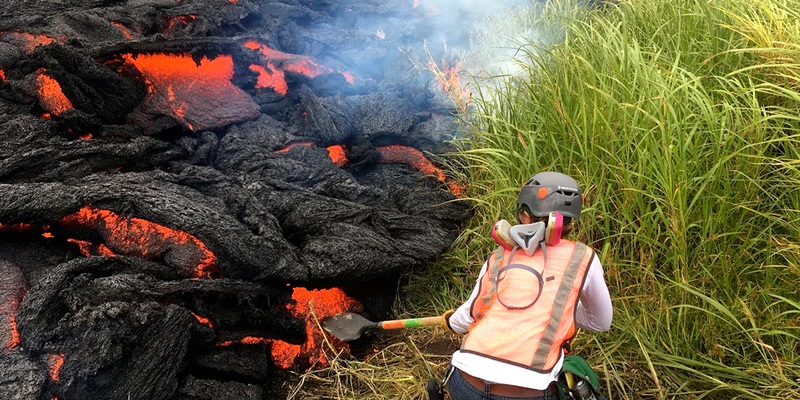 Mulliken’s duties also include collecting samples from active lava flows. The 2012 UH Hilo graduate in geology and anthropology went to graduate school in Alaska, where she lives and works. She says this homecoming is bittersweet. “Iʻm really happy and grateful that I get to be here helping out. Itʻs been a little hard. You know, itʻs hard to see people really impacted, friends and family,” she said. Mulliken is one of three UH Hilo graduates working with the U.S. Geological Survey team responding to the eruption. On top of being well trained, the Hilo graduates have local knowledge that has been invaluable to officials. Mulliken says it’s been nice to see so many familiar faces. 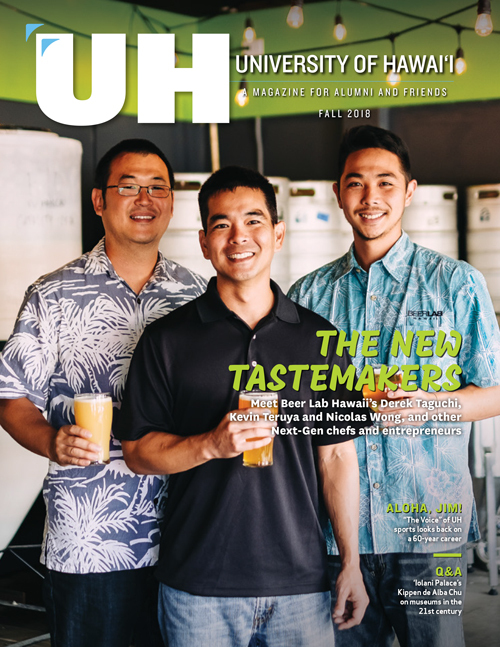 She’s not surprised that UH Hilo offered to house the Hawaiian Volcano Observatory after it was forced to evacuate its building at the summit of Kīlauea because of the explosive events occurring there. It’s a big reason why she hopes to return home for good and use what she learned at UH Hilo, to serve her community.